Finding 4: Even When Excluding “Transfer-Out” Students, Completion Problems Still Exist. Until last year, our understanding of how many students obtained a college degree was surprisingly limited, as the federal graduation rate left out a wide swath of our current college-going population by only counting first-time, full-time students. This incomplete data left institutions decrying federal graduation rates as an unfair representation of their true success with students.1 But what happens if you were also able to count part-time students and those who transferred into an institution? Would the graduation rate go up, go down, or remain the same? Last fall, the federal government released institutional graduation rates that include part-time and transfer students for the first time ever—providing researchers and policymakers with the clearest picture yet as to how well colleges are doing when it comes to helping all of their students earn a degree once they’ve started. An analysis of this data finds that when including students who have transferred into an institution in addition to those enrolled as part-time, the federal graduation rate actually decreases, further illustrating the reality that we have a college completion crisis in the United States. Given this new data, this memo identifies where our system is falling short and outlines key priority areas policymakers should address to ensure that more students who start college actually finish with the credentials and degrees they need to be successful in today’s economy. To conduct this analysis, we used the new “Outcome Measures” survey data released through the U.S. Department of Education’s Integrated Postsecondary Education Data System (IPEDS) database in October 2017.2 Unlike the previous Graduation Rates surveys released by the Department—which only looked at first-time, full-time students—this data incorporates part-time and transfer students into institutional graduation rates for the first time and provides us with outcomes for four separate groups of students: 1) first-time, full-time, 2) first-time, part-time 3) non-first-time, full-time, and 4) non-first-time, part-time. The designation “non-first-time” includes students who have transferred into an institution. It should be noted that the new Outcome Measures survey treats students who “transfer out” from an institution as non-graduates, but gives credit to an institution for graduating students that “transfer in.” This treatment of transfers is likely to have a greater effect on institutions that transfer out a higher percentage of their student body populations, a factor that should be taken into consideration when reviewing this analysis. However, the federal graduation rate has always counted transfer out students in this way, meaning that the purpose of this analysis is to show how this federal rate changes when part-time and transfer-in students are included in the calculation. We fully acknowledge that there remains room for improvement in federal graduation measures, however, this new data presents an important opportunity to better understand the completion rates of a broader range of students than previously before. Over the past several years, many institutions have raised concerns that the federal graduation rate—which only counts first-time, full-time students—is unreflective of their student body and, therefore, inaccurate and unfair.5 But the national portrait of college completion actually looks worse when including those previously invisible students. For students who entered an institution in 2008—including part-time and transfer students—only 45% obtained an award or degree by 2016 at the institution where they started. By counting part-time students and those who transferred into an institution, the data reveals that the overall outcomes for this cohort are six percentage points lower than the graduation rate for first-time, full-time students during the same eight-year time frame. The data also reveals that this gap in graduation rates between only first-time, full-time students and outcomes for all students exists across all levels of institutions, and actually widens as you move from four-year to two-year and certificate-granting institutions. Part-time students make up 25% of all students in the new Outcome Measures data, and their enrollment is projected to grow faster than full-time students through 2025; yet, this data confirms what previous studies have shown—that part-time students are also significantly less likely to graduate than their full-time peers.8 With these students making up one-fourth of our college-going population, this gap is a significant driver of the college completion crisis. Broadly speaking, part-time students face different obstacles than their full-time peers, including being more likely to work at least 40 hours per week while attending school and/or raising children—undoubtedly making it more difficult to complete a postsecondary program at the same rate as full-time students.11 While these barriers provide a reasonable expectation of why it may take part-time students longer to complete a certificate or degree, it’s important to note that this data measures how many students complete their programs within eight years – a significant amount of time, especially for those enrolled in two-year degree and one-year certificate programs. As mentioned in the methodology section, the current federal graduation rate continues to count all students who transfer out of an institution as “non-graduates,” as the federal ban on student-level data makes it impossible for students and policymakers to know how many transfer students go on to enroll in and graduate from a subsequent institution. As a result, treating transfer-out students as non-graduates is likely to have a disproportionate effect on institutions that pride themselves on transitioning students to institutions that offer more advanced degrees, such as many in the two-year college sector do today. To account for this shortcoming, this section analyzes what the federal graduation rate would be by removing “transfer out” students from an institution’s enrolling cohort. To do so, we use the Outcome Measures data, and we exclude transfer-out students from institutions’ graduation rate calculation altogether, rather than treating them as non-graduates. The data makes clear that significant completion problems remain present at all levels of institutions, even after removing transfer-out students from the current graduation data.15 While graduation rates increase across the board when you do the calculations as if none of those students who transferred ever enrolled in the first place, we see that more than four out of 10 students who entered an institution in 2008 and did not transfer out still failed to obtain a certificate or degree at that institution eight years after they enrolled. 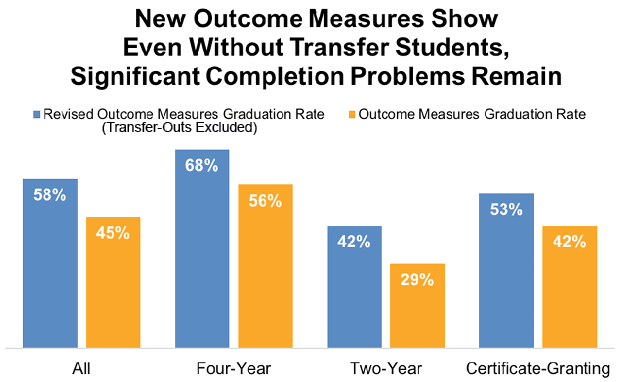 This is particularly notable within the two-year sector—which has a higher number of students who transfer out—as this analysis shows that even after removing transfer-out students, the graduation rate remains a paltry 42% after eight years.16 This means that even after we are removing transfers, the majority of students who enter a two-college fail to obtain any sort of credential, even nearly a decade after enrolling. This new outcomes data released by the Department of Education paints a fuller picture than ever before. We can now see that the inclusion of transfer and part-time students lowers the national graduation rate. And while federal data can no doubt be improved upon, the Outcome Measures survey shows the extent to which we continue to lead many students to institutions that leave them little chance to obtain the credentials they initially sought. 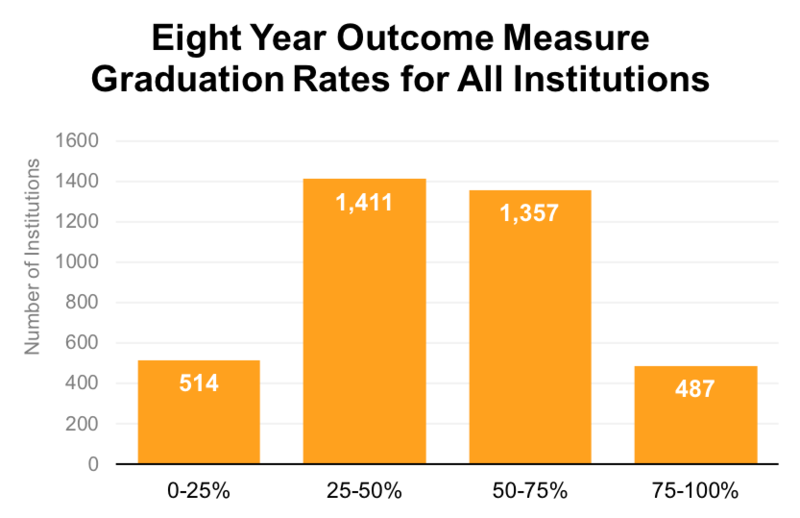 This is apparent through all of the graduation rate calculations made available today—whether you’re looking at the current federal graduation rate, the new Outcome Measures, or completion data from the National Student Clearinghouse—too many students fail to complete a college education even years after they’ve entered an institution. It’s also now evident that with a growing population of part-time students, institutions must prioritize helping these students complete their certificate or degree. If we don’t focus on improving outcomes for this growing student population, we will end up worse than where we are now, with most institutions failing to graduate a majority of their students. There is enough actionable information within this data for policymakers to implement laws that will give taxpayers and students a better chance at seeing the value of their investment in higher education. Federal policies need to be put in place to ensure that institutions are taking some responsibility for the outcomes of the students they enroll and aren’t leaving students worse off after they attend. If policymakers do nothing and the status quo persists, at most institutions across the United States, more than half of entering students will look back eight years later still lacking the certificate or degree needed to succeed in today’s economy. Click here to download the data referenced in this report. Peter McPherson and Andrew Kelly, “The College Scorecard Strikes Out,” The Wall Street Journal, Printed on March 17, 2016, Accessed on December 22, 2017. Available at: http://www.aei.org/publication/the-college-scorecard-strikes-out/. Throughout this paper, the ranges we use in our analysis reflect the following: 0-24.99 = 0-25%, 25-49.99 = 25-50%, 50-74.99 = 50-75%, 75-100 = 75-100%. In order to obtain the predominate degree within the new Outcome Measures survey data, we matched the predominate degree in the 2017 release of College Scorecard data with the IPEDS unit ID in the October 2017 Outcome Measures data release. Unmatched institutions were not included in this analysis. Ellen Wexler, “The Ignored Graduates,” Inside Higher Ed, Printed on May 5, 2016, Accessed on December 4, 2017. Available at: https://www.insidehighered.com/news/2016/05/05/stories-students-not-counted-federal-graduation-rates. While 42% of the students who enroll in two-year institutions and 34% of the students who enroll in certificate-granting institutions enter as part-time, only 12% of the students who enrolled in four-year institutions entered as part-time in the 2008 Outcome Measures cohort. This uses data from the Outcomes Measures dataset to make this assertion. Other studies, such as, “Time Is the Enemy: The Surprising Truth about Why Today's College Students Aren't Graduating... and What Needs to Change,” from Complete College America calculate part-time student enrollment closer to 40%. Accessed on December 22, 2017. Available at: https://eric.ed.gov/?id=ED536827; See also, United States, National Center for Education Statistics, “Undergraduate Enrollment,” Last updated May 2017, Accessed on January 18, 2018. Available at: https://nces.ed.gov/programs/coe/indicator_cha.asp. Calculation done by author by separating all full-time and part-time students within Outcome Measures data. United States, National Center for Education Statistics, “Undergraduate Enrollment,” Last updated May 2017, Accessed on January 18, 2018. Available at: https://nces.ed.gov/programs/coe/indicator_cha.asp. Marcella Bombardieri, “Hidden in Plain Sight: Understanding Part-Time College Students in America,” Published on September 6, 2017, Accessed on January 18, 2018. Available at: https://www.americanprogress.org/issues/education-postsecondary/reports/2017/09/06/438341/hidden-plain-sight/. Michael Itzkowitz, “The State of American Higher Education Outcomes,” Third Way, Published on July 18, 2017, Accessed on January 18, 2018. Available at: http://www.thirdway.org/report/the-state-of-american-higher-education-outcomes. United States, United States Senate, “S.580 – Student Right-To-Know and Campus Security Act,” Passed on November 8, 1990, Accessed on January 18, 2018. Available at: https://www.congress.gov/bill/101st-congress/senate-bill/580. United States, U.S. Department of Education, National Center for Education Statistics, “IPEDS Survey Data,” Accessed on November 8, 2017, Available at: https://nces.ed.gov/ipeds/Home/UseTheData; See also, Michael Itzkowitz, “Risky Bet: Billions of Tax Dollars Fund Lowest-Performing Institutions,” Published on April 18, 2017, Accessed on January 22, 2018. Available at: http://www.thirdway.org/memo/a-risky-bet-billions-in-tax-dollars-fund-lowest-performing-institutions. Note: Interestingly, a greater share of institutions show more than 50% of students earning a credential when including part-time and transfer students even though the inclusion of these students lowers the overall national completion rate. More research is needed to confirm the cause of the disparity between the institutional graduation rates and national graduation rates. For this analysis, institutions with less than 30 students within each cohort were excluded. Furthermore, when examining sub-cohorts, if an institution had a sub-cohort of less than 30 students, they were also removed from this analysis. United States, U.S. Department of Education, “Performance Data by Accreditor,” Database. Accessed January 18, 2018. Available at: https://www.ed.gov/accreditation.